Richie Whitt's DFW Sportatorium: Nelson Cruz Suspended for 50 Games/Regular Season: How Will He and the Rangers Survive? 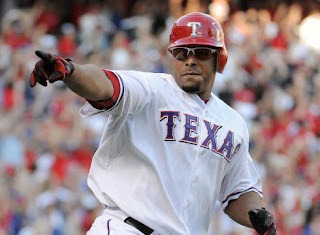 Nelson Cruz Suspended for 50 Games/Regular Season: How Will He and the Rangers Survive? Okay Rangers fans, let's rub our hands together and get this thing going. It's about to get good. Since that closed-door meeting in Cleveland, Texas has won six of seven to resurrect baseball season. Thanks to Derek Holland's Sunday gem - he allowed only four singles over eight innings - the Rangers took two of three in Oakland and have sliced their deficit in the AL West from 6 to 2.5 games in a wonderful week. It all comes to a screeching halt without their best power hitter. And today Nelson Cruz is accepting a suspension that will end his regular season. Now that Major League Baseball has decided its punishment for players connected to the Biogenesis lab in Miami - a story that broke way back during the Super Bowl - all the hype will surround Yankees' slugger Alex Rodriguez. But the most impactful player on the list wears a Rangers' uniform: Cruz. While A-Rod could be suspended through the 2014 season (214 games), the loss of Cruz will severely derail Texas' playoff hopes. He is, after all, the Rangers' biggest and best power hitter, leading them in homers (27) and RBI (76) after yesterday's bomb against the A's. How vital is Cruz to the Rangers? Other than Adrian Beltre, they don't have a bat with more than 16 homers or 46 RBI. Cruz's suspension is 50 games. The Rangers, turns out, have 50 games remaining in the regular season. The Rangers' slugger has decided to accept the suspension, then rejoin the team for the playoffs if they qualify. He could have appealed and perhaps played another 20 games before a final ruling could've landed him ineligible for the post-season. Cruz is making the best of a bad situation: Accepting the consequences, then cross his fingers his teammates have enough pop to get into the playoffs. Without his bat, the Rangers - struggling for runs as is - have minimal options since they didn't acquire a power hitter at the trade deadline. Engel Beltre is left-handed. Manny Ramirez hasn't shown any mash at AAA. Doubtful, but maybe Jurickson Profar goes back to the outfield? Problem is, the Rangers' offense is homer-dependent. During their 6-1 resurgence they've hit 14 and in games they don't hit one they're only 9-26. To amplify this quandary, Cruz is a free agent after this season. Meaning - worst-case scenario - if Texas doesn't make the playoffs, he may have played his last game as a Ranger. And the 2013 baseball season may just have ended. Just when it was getting good. Bill2455, why bring up Matt Garza on a story about Nelson Cruz? Way to show YOUR class, doofus. I think the Rangers will be just fine without Cruz. Bringing up Joey Butler would be the plan, I think. .290 average, 10 HRS and 44 RBIs at Triple-A Round Rock will be a nice addition. Not sure about his defense, but surely he won't be as streaky as Cruz is with over-the-shoulder catches close to the wall? I don't love Garza's character any more than I love the Rangers' chances without Nellie. He got caught! He will pay with a suspension. Do I want him on my team? I think so. What player is out there to replace him?